IMAGES: (1) Guava fruits and branch. (2) & (3) Stone sculptures of Maquetaurie Guayaba from the Dominican Republic and Puerto Rico. (4) Shell amulet of Opiyelguobirán. From the Dominican Republic. (5) Jar of guava jelly. (6) Packet of guava paste or cheese. (7) A bat-like vomiting stick made from manatee bone and used prior to the sacred cohoba trance ceremony. Guava (gwa-va) n, English via Spanish from Taíno. 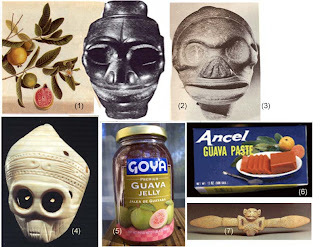 1. from the Taíno word guayaba. 2. from the name of the Lord of the Dead, Maquetaurie Guayaba (Ma-kay-taw-ree Gwa-ya-baa); “Associated with sweetness and delight; symbol of the guayaba berry; bat symbols” (Cave of the Jagua, Antonio M. Stevens-Arroyo). 3. opposite of Yucahuguamá, god of the yuca, of life and the sea 4. any of numerous tropical and subtropical American trees or shrubs belonging to the genus Psidium, of the myrtle family bearing round to pear-shaped green or yellowish to deep red, oval fruit. 5. the fruit used for the making of jam, jelly, Cuban guava paste or Jamaican guava “cheese”, etc. 6. source of Bob Marley’s song “Guava Jelly”, made popular by Johnny Nash. The Taíno, from whom we got the name guava via Guayaba and from whose culture the fruit first entered Eastern Hemisphere cuisine, related this “super fruit” to the God of the Afterlife. Since 1492, the fruit, originating in South America wild and later domesticated, has spread around the tropical and subtropical world. I grew up eating a variety of fresh guavas from the tree, watched my mother make guava jelly and as a schoolchild, bought cellophane-wrapped guava cheese candy from vendors who hawked their goods outside buses at Cross Roads in Kingston, Jamaica. I have even planted guava seeds and reared the trees as exotic plants in these Northern climes. One can find packaged guava items in the international section of Shoppers Food and other supermarkets. Some Latin American stores sell large fresh guavas and there are fruit bearing specimens next to the Capitol in Washington, D.C.’s Botanical Garden. Two of my favorite desserts are cream cheese in stewed guava shells and a cream cheese slice with a guava paste wedge on a toothpick, served to guests as a hors d’ouvre. I first tasted these complementary flavors in a Cuban restaurant in Washington, D.C. Now the food establishment has deemed guava as a super fruit. What did the Caribbean’s Taíno people think of this berry that Spanish explorers and Portuguese traders inadvertently introduced to the wider world? The international names for this Tropical American tree and fruit are guayaba, guava, goiba, govier, gouyave, goyavier, djamboe, djambu, dipajaya jambu, perla bayawas, bayawis, petokal, and tokal. The fruit of the guava tree was associated with sublime delight as well as with the lord of the spiritual island-underworld. This association by the Taíno makes it one of their most highly esteemed fruits. The value placed on the guava fruit reveals the Taíno attitude towards life and death. They believe in dualities in the universe, that opposites always existed together. Maquetaurie Guayaba, the Lord of the island of Coabay and of Sweetness and Delight, is the Taíno lord of the dead. It is from his name that the English word "guava" was derived. The guava tree is a native Tropical American plant. The Spanish and Portuguese took the fruit to countries in Africa, to India, Australia, Taiwan and the southern United States. A member of the extensive myrtle family, it shares a relationship to the clove, cinnamon, nutmeg, allspice and eucalyptus. The Taíno grew the guava tree and the Inca widely cultivated it. The tree reaches a height of 30 feet tall and has spreading branches that grow close to the ground. It sometimes has a scaly bark and smooth branches are khaki-brown to a greenish-brown in color. Its oblong leaves are 3 to 7 inches in length with prominent veins. The fragrant white flower appear singly or in bunches and can be self-pollinating but achieve a higher yield of fruit when cross-pollinated. The 150 species of guava bear sweet smelling fruits that vary in shape, size, color and taste. The fruit has a thin edible skin that can be yellow to red, white, black, or green with many or a few seeds. The flesh can be surprisingly sweet to highly acid and may vary in colors of white, yellow or salmon. It has a distinctive aroma that can be from mild and pleasant to penetrating. Today the guava tree still grows in a semi-wild state or is cultivated for its fruit. It is one of the most widely used fruits in many tropical and sub-tropical countries. Eaten as a fresh fruit it is also stewed with sugar or used to make nectars, mixed with other juices, made into sorbets, ice cream, pies, and cakes or into a guava cheese or paste. York Castle Tropical Ice Cream, (http://www.yorkcastleicecream.com/) a Jamaican store in Silver Spring, Maryland, sells an ice cream mixed with chunks of stewed guava “shells”. The fruits are difficult to store and are best eaten straight from the tree. They are sold in markets near where they are grown, or transported to some Caribbean or Latin American stores near areas where populations from those countries have settled. Nutritionally guavas contain a high degree of vitamin C and potassium. They also contain niacin, vitamin A, with some phosphorus and calcium. In Cuba, Haiti Trinidad, Mexico, Ghana, Malaya, and the Philippines the guava is valued for its astringent and laxative properties. Although it is not sure how effective the remedies are, according to one report, some folk practitioners in these and other countries utilized parts of the guava medicinally. Uses are as an astringent, bactericide, for the bowels, bronchitis, cachexia, catarrh, cholera, chorea, colic, cough, convulsion, deafness, diarrhea, dysentery, epilepsy, hysteria, fattening, fever, gingivitis, hemorrhoids, itch, jaundice, nausea, nephritis, repertory ailment, rheumatism, scabies, sores, sore throat, spasm, a tonic; for toothache, ulcer, vermifuge, vulnerary and wounds. Eastern Hemisphere n, 1. Africa, Asia, and Europe. 2. continents and islands on the opposite side of the globe from the continents and islands of the Americas. 3. opposite to the Western Hemisphere from which at least 60% of the food eaten in the world originated.